When work needs you to make those big meetings during the week, and your family is in need of a short vacation for the weekend you need a vehicle that can do it all. The 2018 Chevrolet Traverse is the perfect midsize SUV for every situation where you want to make every mile of your life count. Starting at a reasonable $29,930 the Traverse by Chevrolet offers a splendid amount of reliability and function. With any road you decide to travel, the Traverse has technology and power to get you there happy and healthy. To prove this point further, the Traverse has earned a 5-Star Overall Vehicle Score for safety from the National Highway Traffic Safety Administration. Dependability and recognition like that need no hesitation. The 2018 Traverse also offers plenty of power and storage space. With up to 310 hp the Traverse can speed down any highway you. As for storage, the 23 ft³, 98.2 ft³ with seat area along with 1,500 pounds of raw towing power, you will get anything including up to an impressive eight people where they need to go. Traveling with the Traverse is all about traveling in ideal comfort and harmony. The 2018 Chevrolet Traverse is truly a do-everything vehicle. The best way to understand the Traverse though is to understand how it can be used with real-life examples. A family who loves to go on frequent round trips to their beach house is in need of a comfy vehicle with plenty of space for the whole gang and their cargo. Sally needs two suitcases for her swimsuits and hair care items, Jimmy needs all his favorite sand toys, and Jane can’t relax without her custom chair. On top of that, they need to haul grandfather’s boat to the dock so the kids can learn to fish. For them, the Traverse is a memory maker. A new couple is moving into their first house together and is determined to make it a home. In order to complete this lofty goal, they must have a roomy and strong vehicle that can help them move all their stuff. Additionally, they have a few new DIY projects they need to get started on and need a way to get all the wooden boards, plants, and other materials home with them. For this couple, the 2018 Traverse is an ally on a quest to build a home. A single parent has to juggle their job as well as their kid’s many activities, and they need a versatile vehicle that is ready for work and plays with room to spare. They are involved in a carpool for sports season and help with many of the PTA events at school which always keeps their ride filled with kids and items for the next bake sale or canned food drive. Also, work likes to use their double garage as storage for extra shirts from the store, so they are often moving boxes back and forth. For this single parent, the spacious 2018 Chevrolet Traverse is a lifesaver for keeping on top of their responsibilities as a parent and a professional. The 2018 Traverse can be used on a number of occasions. All in all, this ride can be a friend, ally, and even a lifesaver for anyone who drives it. The 2018 Chevrolet Traverse comes in seven trims all with their own set of stylish and convenient features. The L is the most affordable trim level and fits eight people comfortably. It has the 3.6L V6 enough and 9-speed automatic transmission with dual-outlet exhaust. LS is everything the L trim level has, plus a deep-tinted glass for privacy. The LT comes in cloth or heated leather seating, roof rails, and extra safety alert and assist systems. The RS comes with the 2.0L turbocharged 4-cylinder engine and 20-inch wheels. It is all about massive style upgrades with signature black accents. The Premier trim level has the 3.6 V6 engine along with wireless charging for devices, heated wheel, and hands-free liftgate. Finally, the High Country trim level has everything ever another trim has, and everything they wish they could have including standard all-wheel-drive, trailering equipment, and even more safety alerts. 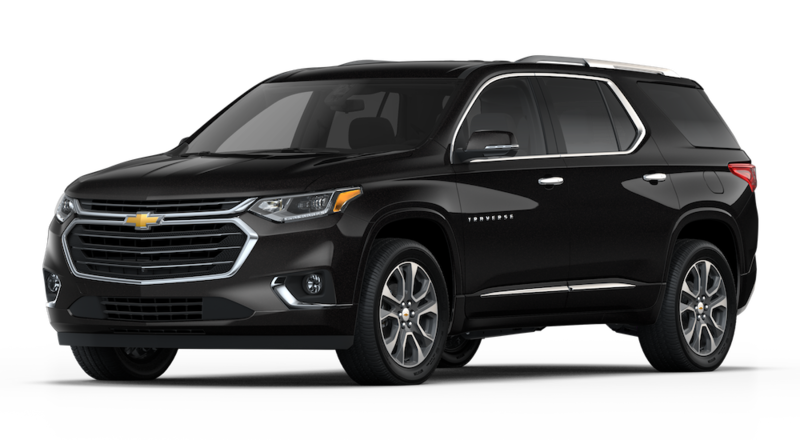 The 2018 Chevrolet Traverse offers two engine types and can be bought in either front-wheel drive or all-wheel drive. The 2.0L Turbo 4-cylinder contains 255 hp and 295 lb-ft of torque. The 3.6L V6 engine has 310 hp and 266 lb-ft of torque. Both of the 2018 Traverse engines include variable valve timing (VVT), direct fuel injection, and start-stop technology. Pair either engine with 9-speed automatic transmission to produce optimal performance. The Chevrolet Traverse also holds 1,500 pounds of towing ability. As a real-life example, you would need 4,000 tow capacity to haul your average trailer so with the 2018 Traverse you can probably get your jet ski or a boat on the smaller size to the docks. Chevrolet breeds reliability with every part it places into its versatile vehicles. Three years in a row Chevrolet has won the J.D. Power Dependability Awards for cars, trucks, and SUVs. On top of that, almost every Chevrolet made vehicle has earned a five star NHTSA vehicle score. No one wants to go to a dealership they can’t trust. Luckily, Chevrolet offers plentiful resources and customer service options in order give drivers satisfaction over doubt. Along with reliability, with five categories including cars, electric cars, performance vehicles, SUVs, trucks, and commercial vehicles, Chevrolet dealerships are never short on variety. They are also always forward thinking with six vehicles already lined up for the upcoming season. If you want a company you can trust to know what you want and have it too; Chevrolet will never disappoint. At Carl Black of Nashville you can purchase a variety of Chevrolet, GMC, and Buick vehicles, but more than that you can purchase them from a dealer with a dependable smile and nothing but satisfaction on the mind.